You are at:Home»Articles»Where Did The 1914 Date Really Come From? There is a lot of misunderstanding, misinformation and purposeful and calculated misleading concerning the subject of where the year 1914 came from. No, I am not talking about how this date was derived, but who originated it. The Watch Tower Bible and Tract Society and the International Bible Students ascribe the origination of the 1914 date with their founder Charles Taze Russell. 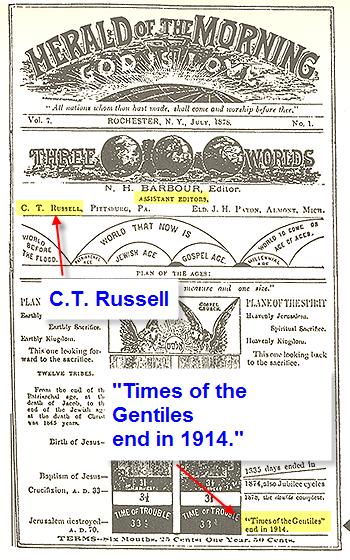 The International Bible Students – who today claim that they are not associated with the Watch Tower – claim that Charles Taze Russell did not believe in the 1914 date. Is either of these groups telling the truth? And, if they are not, why not? First of all, what is the 1914 date? The terrific war outbreak in Europe has fulfilled an extraordinary prophecy. For a quarter of a century past, through preachers and through press, the ‘International Bible Students’ . . . have been proclaiming to the world that the Day of Wrath prophesied in the Bible would dawn in 1914. So before the year 1914 came, the ‘International Bible Students predicted and was in expectation of that year being when Christ’s presence would occur. Who Originated The 1914 Date? Contrary to what is being taught by both the Watch Tower and the International Bible Students, it was not Charles Taze Russell who originated the teaching of the 1914 date. Most Jehovah’s Witnesses and International Bible Students are not aware of this. Most believe that the 1914 teaching originated with C.T. Russell and the organization he founded. No thought is given to it coming from a source outside those organizations. Many Jehovah’s Witnesses and International Bible Students when told this, refuse to believe it and display an uncanny “I don’t want to know or hear any more about this” posture. It is painful to accept the fact that 1914 did not come out of the International Bible Students or Watch Tower organizations. To believe that it came outside of the Watch Tower organization would be to admit that God used another organization or Faithful Slave; that would be unacceptable to Jehovah’s Witnesses and International Bible Students. 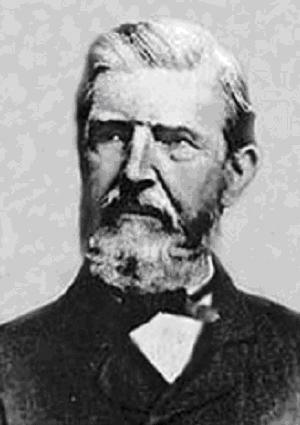 Charles Taze Russell, as a young man and as a Second Adventist, was tutored by Mr. Barbour and held him in high regard. Mr. Barbour was the Editor of the Second Adventist monthly magazine “Herald of the Morning” where he hailed 1914 as the date of Christs Second Presence. So the International Bible Students claim that the Second Adventist nor Charles Taze Russell never believed in the 1914 date, it is not true. Neither is the Watch Tower organizations claim that the 1914 date came from their organization is true. Before they were founded, the 1914 date was being hailed by its originators, The Second Adventist. I have caught a lot of heat from The International Bible Students and WatchTower adherents about this. They have gone on the offensive and think by diverting attention on me and attacking me as “misrepresenting what Russell believed and taught”, they can draw attention away from themselves as being in error and to the facts. In other words, attack the bringer of the news and make him the subject. In my view, if one feels the need to do this, then it is not the truth they have or seek. They seek to conceal it. In my view, the truth is powerful enough to stand on its own. The fact is that it was the Second Adventist who originated the 1914 date and when Russell broke away from that movement, he carried the date with him when he founded the International Bible Students. The International Bible Students attempt to cloud these facts by use of many grandiose words with no substance to them in an attempt to say “not true” but they are not forthcoming. And, as far as the Watch Tower Bible and Tract Society, they too, have been guilty of misleading it’s membership into believing that the 1914 date came out of what they believe to be God’s Earthly Organization. I guarantee you that most Jehovah’s Witnesses do not know these things; and if asked, “Where did the 1914 date come from?” they would either answer “From the Bible” or “Charles Taze Russell” or “From God’s Earthly Organization.” All of these responses would be incorrect. They do not know that this date was originated by The Second Adventist and Charles Taze Russell adopted it when be broke away from that movement. This presents a major problem for the International Bible Students and Watch Tower organization. What problem? As the time neared for Jehovah to begin to unify true worshipers with himself by means of Jesus Christ, God sent him to earth to act as His spokesman. (Heb. 1:1, 2) Then with the outpouring of holy spirit at Pentecost of 33 C.E., the Christian congregation was brought into existence. After Jesus had returned to heaven, this congregation became Jehovah’s arrangement for instructing and for coordinating the efforts of individual Christians. There were overseers to take the lead in local congregations, and a central governing body made necessary decisions and helped to coordinate activity. Clearly, Jehovah had brought into existence an organization on earth made up of true Christians. So here we see that according to the Watch Tower, Jehovah brought into existence an organization on earth made up of true Christians. Here is the problem: If, as I have shown above, that the 1914 date did not come out of the Watch Tower organization or the International Bible Students organization, but came out of another organization – The Second Adventist, – then were the Second Adventist being used by Jehovah to bring the 1914 date? Where the Second Adventist (who are known as Seventh Day Adventist today) a part of that organization that came into existence on Pentecost 33 CE? Did Jehovah use two separate organizations? So do you see the problem and, more importantly, why the Watch Tower organization and The International Bible Students conceal and cover this over? It would be devastating for them as organizations. A date primed and advertised – with a certainty – as being true and so pivotal to the other things they teach would be proved false and cause the house of cards to come crashing down. It is appalling to me that these organizations would purposefully carry on the teaching of a lie for the sake of well, saving face. By Jesus’ own words alone, the establishment and belief in a date – 1914 – should be enough! His words should be the end of discussion. Yet, humans and their organizations say they know. And, a particular organization says it is 1914. Jesus says we do not know on what day the Lord is coming. Yet, a particular organization says they do know; it was in 1914. The knowing of such things belong only by the Father. Yet, a particular organization says it is in their jurisdiction. Does the reader see this abject defiance by religious organization to what Jesus has said. Yet, these organizations press forward away – business as usual – ignoring what Jesus said or trying to convince others that Jesus did not mean it that way or trying to convince others that those persons who highlight what Jesus said – like myself – are somehow crazy or misinformed. You see, if you champion what Jesus taught, it really bothers those who are of religious organization and who claim to be Christians. Something Jesus never told them to be called anyway. A very subtle, disturbing and nearly un-noticeable trend that has surfaced is being practiced by the religious system call by men, Christianity. First, the religious organization stations itself up as being of and for God and Christ. They do this by taking on the title Christian and using Jesus’ name. Secondly, it teaches some truthful things. This gives the appearance that it is pro-Christ. Lastly, it throws in things that Christ did not teach but push them off as Christs teachings or The Word of God. Jesus warned that such a thing would occur. He said many would come on the basis of his name (truthfully) declaring that he is the Christ, but would mislead many. That aptly fits the system of religion called by men, Christianity. There are over 33,000 contending Christian denominations that all truthfully acknowledge that Jesus is the Christ. But, as Jesus said, will mislead many. The 1914 date is one of many great misleadings that is occurring right before ones eyes. So powerful and influential this teaching is, is that those who believe it are so blinded that they do see Jesus’ words at Matthew 24:36, Matthew 24:42 and Acts 1:7. At Matthew 24:45-51, Jesus asks the question, “Who really is the faithful and discreet slave …” Jehovah’s Witnesses apply this to their Governing Body. This application is arrogant and narrow-minded. This group have men have always been primarily and exclusively White men. (Only recently was a Black man – Samuel Herd – added to the ranks and it was a token move). I am sorry I find it hard to believe that Jehovah would select all White men when his creation is of a great variety of people of many colors. It does not jive with who Jehovah is. If this evil slave felt that the Master was delaying, then he was in expectation of him at a certain time. This is exactly what the Watch Tower organization and the International Bible students has done concerning 1914. They advertised this date as being the date of Christs return long before the year arrived. They, like the evil slave, expected the Masters arrival. Based on this and in answer to Christs question, “Who really is the faithful and discreet slave …” it is not the Watch Tower organization or the International Bible Students. It is these organizations who will beat those – like myself – who have NOT ignored what Jesus said at Matthew 24:36. I declare that no human or angel can know when the Lord comes. I take a beating from these organizations and their membership for this stand. So who are the faithful and discreet slaves, those who listen to Jesus’ words at Matthew 24:36 and Matthew 24:42 and who champion the truth of his words and boldly declare them to others so that they will know the truth. This is what the Watch Tower organization and International Bible Students fear. They fear one listening to Christ because it would mean a withdrawal of membership to them. Such withdrawals translate into what does not go into those contribution boxes.